Latest Nokia Mobiles Launched in India Recently, Specs, Price and Buying Advice. Nokia has launched the new Nokia 7.1 in India yesterday and the phone will go on sale online as well as offline. The phone will go on sale starting 7th December and will be available from all major offline stores and online stores. The company has brought only 64 GB storage and 4 GB ram version in India for a price tag of Rs. 19,990. The phone was earlier unveiled at an event in London and now is launching in India. Notably, you can get a 10% discount on purchase using the HDFC bank debit or credit card. So, it can cost you close to Rs. 18,000. The Nokia 7.1 sits in the Nokia portfolio between the previously launched Nokia 7 Plus and the Nokia 6.1 Plus. The increasing competition in the 10k to the 20k range is making it very difficult for brands to launch products which appeal to a majority of buyers. Android Pie – Out of the Box. The Nokia 7.1 comes with a similar glass back design that is also present on the Nokia 6.1 Plus. The phone has notch display and robust metallic edges. Like the original Nokia 6, this also made from Aluminum 6000 grade material. It is easily one of the best-looking devices in the sub 20K price range and competes with the likes of Poco F1 and Honor Play. There is a 5.84 Inch PureDisplay (1080×2280 pixels) that comes with a 19:9 aspect ratio. Additionally, there is Corning Gorilla Glass 3 protection. The Phone has 8 mm thickness and 160 grams weight. Further, there is real-time SDR to HDR conversion technology used by Nokia powered by a 16-Bit engine. It offers a more immersive video experience on popular streaming services. Noticeably, the phone is not very big considering it has a 5.8-inch display. Phones like Realme 2 Pro or the Redmi Note 6 Pro comes with a much larger display panel (6.2 Inch). Powering the device is the Qualcomm Snapdragon 636, Octa-Core Processor and the Adreno 509 GPU. The phone comes with 64 GB internal storage and there is 4 GB of DDR4 Ram. The storage is further expandable upto 400 GB using the micro-sd card. For photography, the Nokia 7.1 comes with Carl Zeiss Optics and has a Dual Rear camera at the back. The back cameras come with 12 MP+5 MP lens which has f/1.8 aperture and 1.24-micron pixel size. The phone comes with superior HDR and portrait mode and there is EIS for stabilizing videos. At the front, there is an 8 Megapixel camera (Nokia 6.1 Plus has 16 MP), that comes with f/2.0 aperture and has an 84-degree wide angle lens. The phone comes with a 3060 mAH capacity battery which seems less in comparison to several rival phones. However, the company is bundling it with a fast charger (18 Watts) to make sure you can charge it rapidly. (50% charge in 30 minutes). Another notable thing is that the overall size of the device is not very large, hence the battery capacity seems adequate. The key highlight of the Nokia phones is the presence of stock Android experience and even the Nokia 7.1 comes with latest Android OS – Android 9.0 Pie. The phone has the latest software from Google and is also part of the Android One program making it eligible for faster future updates. Other Features include presence of USB TYpe C Port, 3.5 mm headphone jack. Also, there is fingerprint scanner at the back, and it comes with the face unlock feature. After the recent launch of Nokia 5.1 Plus in the Indian market, HMD global has now introduced a refreshed Nokia 3.1 Plus in India. The phone comes in 2 storage and ram variants: 2 GB ram and 16 GB storage, 3 GB ram and 32 GB storage. The higher version costs Rs. 11,499 and the lower version price is not yet shared by the brand. However, we can expect it to be sub 10k for the lower version. The key Highlight of the Nokia 3.1 Plus is its elegant aluminum build and pure stock Android One Experience. The Phone comes in 3 color options – blue, white and Baltic. The phone comes with a large 6.0 Inch HD+ (1440*720) pixels display with 18:9 aspect ratio and there is no notch. Additionally, there is 2.5D curved glass to improve the experience. However, the brand has not specified the Gorilla Glass version on the Nokia 3.1 Plus even on the official website. The Nokia 3.1 Plus comes with the Android Oreo Os along with minimum bloatware and will also get regular software/OS updates for the next 2 years from Google. Also, the phone will get the Android Pie update very soon to enhance the user experience. Powering the phone is the Octa-Core Helio P22 Processor which offers fast lag-free experience. As stated above, there is 2/3 GB ram (LP DDR3) and 16/32 GB internal storage that is user expandable upto 400 GB via micro-sd card. Like most mid-range phones the Nokia 3.1 Plus comes with Dual Rear Camera Setup. The primary cameras is a 13 Megapixel shooter with f/2.0 aperture while the second lens has a 2.4 aperture. You can click portrait shots and can even adjust the amount of bokeh after clicking the image. Also, at the front, we get an 8 Megapixel shooter to click selfies that comes with f/2.2 aperture. The phone comes with the micro-USB port (no USB Type), and there is a fingerprint scanner and a 3.5 mm headphone jack. Fueling the Nokia 3.1 Plus is a large 3500 mAH capacity battery, which most likely misses on the fast charging support. (No official confirmation was given by Nokia). Furthermore, there is Bluetooth 4.1 and there is even NFC support present on the device. Lastly, the phone measures 8.2 mm in thickness and weighs 180 grams. Nokia has launched the Nokia 5.1 Plus in the Indian market and the phone is available exclusively on Flipkart. The Nokia 5.1 Plus costs Rs. 10,999 and will go on sale on 1st October 2018. You may be able to buy the Nokia 5.1 Plus from retail stores at a later date. The Nokia 5.1 Plus comes with a really powerful Helio P60 Octa-Core processor clocked at 1.8 GHz and has the ARM Mali G72 MP3 GPU to take care of all graphics intensive games. We have previously tested the Helio P60 in the Oppo RealME 1 and the Oppo F9 Pro and it is fantastic chipset to run games like PUBG, Asphalt 9 with decent settings. Furthermore, the Nokia 5.1 Plus comes with 3 GB of Ram and has 32 GB internal storage that is user expandable and it even comes with a hybrid sim slot to expand the storage to 400 GB. Notably, the Nokia 5.1 Plus comes with the Android Oreo 8.1 with stock experience and will also get the Android P update soon. Further, it comes with a 5.86 Inch notch display with HD+ resolution (19:9 aspect ratio) and 720×1520 pixels. For Photography, the Nokia 5.1 Plus comes with Dual rear cameras – 13 Megapixel sensor with f/2.0 aperture and a secondary 5 Megapixel camera for depth sensing. At the front, it comes with a f/2.2 aperture, 8 Megapixel selfie camera to capture detailed images. The battery is not excessively large, it comes with a 3060 mAH capacity battery that is sufficient to last all day. Inside the box, it comes with a 5V/2A charger with quick charge support. The connectivity options include Dual Sim, 3.5 mm headphone jack, 4G VOLTE support and Bluetooth Version 4.2. There is a single speaker present at the bottom and Nokia is also boasting AMP+ support for the mobile for superior Audio. Surprisingly, the Nokia 5.1 Plus sports a USB Type C Port which is still missing on several expensive phones. Should You Buy the Nokia 5.1 Plus? There are many smartphones in the market in the 10k to 12k price range such as the Zenfone Max Pro M1, Xiaomi Redmi 6 Pro, or even the Oppo RealME 1. Still the Nokia 5.1 Plus is a very good offering by the company and is a really worthy phone for the price. If you like the Nokia brand and love their products can opt for the Nokia 5.1 Plus. Another thing to note is with the launch of Nokia 5.1 Plus and 6.1 Plus Nokia has become aggressive with the pricing strategy in India. I was expecting higher price from Nokia for these phones from past experience but Nokia wants to take on RealMe and Xiaomi with some aggressive launches. Update – 21- August – 2018 – Nokia India has launched the new Nokia 6.1 Plus in the Indian market today, at an event held in New Delhi, for an aggressive price tag of Rs. 15,999. Notably, the Nokia 6.1 Plus was launched in China 2 months back as Nokia X6 and now the mobile is launched in India. The Nokia 6.1 Plus will go on sale on Flipkart exclusively starting 31st August 2018. The price for the mobile looks aggressive considering the specs. Moreover, it rivals the competition devices such the Xiaomi Redmi Note 5 Pro, Mi A2, Oppo RealME 1 and the Asus Zenfone Max Pro M1 (6 GB). The phone comes in 3 color variants – Gloss White, Blue, and Black. The Nokia 6.1 comes with an attractive glass back design which is glossy. At the front, there is an iPhone X like notch and Nokia branding at the bottom of the mobile. The phone offers a 5.8 Inches Full HD+(2280*1080 pixels) display and comes with 2.5D Curved glass coating and has a 19:9 aspect ratio. Additionally, the display is protected using the Corning Gorilla Glass 3, a big positive for the Nokia mobile. Powering the Nokia 6.1 Plus is the Qualcomm Snapdragon 636 Octa-Core processor along with the Adreno 509 GPU. There is 64 GB of internal storage and 4 GB ram. The storage is expandable upto 256 GB using the micro-sd card slot. We can expect great performance from the Nokia 6.1 Plus as the processor and ram are sufficient and fast. It is similar to the Zenfone Max Pro M1 or the Xiaomi Redmi Note 5 Pro which uses the same SOC. 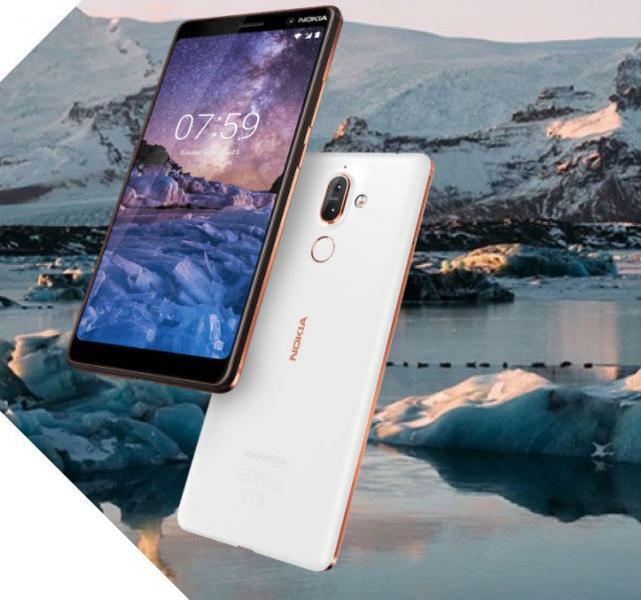 Further, the key highlight of the Nokia 6.1 Plus is the presence of Android One experience that offers the latest Android Oreo 8.1 OS to the users. The phone comes with stock Android experience and will get the Android Pie (Android 9.0) very soon as per the brand. Also, you will not get any bloatware in this mobile and the latest security patches will also roll out faster. For imaging, it comes with a pair of cameras at the back with 16 MP primary sensor, having a f/2.0 aperture and a secondary camera with 5 MP, f/2.4 aperture for depth sensing. Additionally, on the front side, we have a 16 Megapixel selfie camera with f/2.0 aperture. The cameras on the Nokia 6.1 Plus also comes with the Bothie feature and AI camera. However, the f/2.0 aperture for the main camera looks no match for the Xiaomi Mi A2, f/1.75 aperture rear camera. Other features include the presence of Bluetooth 5.0 and USB Type C port which is usually rare in this price range. There are standard connectivity options such as WIFI, 4G VOLTE support, and Dual Sim. The phone comes with a fingerprint scanner at the back side and even has the face-unlocking support which is the vogue these days. Also, it comes with a 3060 mAH capacity battery and has fast charging support. Lastly, the phone has 8 mm in thickness and weighs 151 grams. The Nokia 6.1 Plus looks impressive for the price, in fact, it is one of the most aggressive Nokia phones in the market that the company has launched in the last 1 year. There is plenty of competition in the 15k to 20k price range and there are several good phones as mentioned at the start of this article. We will be doing a full review for the Nokia 6.1 Plus soon so stay tuned for more on Candytech. You can read below about the latest Nokia 3.1 launched in the Indian market last month. Update – 20 July 2018 – Nokia has launched the latest Nokia 3.1 phone in the Indian market. The phone was originally launched in Russia back in May 2018 and now the company has brought it to India. The Nokia 3.1 will be available in the Indian market from 21st July 2018 and you can buy it both from the retail stores as well as online from the Paytm Mall. The price of the phone is Rs. 10,499 and it comes with 16 GB of internal storage and 2 GB of Ram. It is available in Blue/Black/ White color options. The key highlight of the phone is the presence of Android One certification that makes sure that you get monthly security patches for 3 years and also will get two major Android updates (Android P and Android Q). The mobile runs on the latest Android Oreo 8 out of the box and comes with stock Android Experience. Another top feature is the presence of 18:9 aspect ratio full view display. It comes with a 5.2 Inch HD+ (1440*720) pixels resolution display and even has the Corning Gorilla Glass protection. Processor – Mediatek 6750 With 1.5 Ghz Clock Speed (Octa-Core). Storage – 16 GB internal storage, expandable via micro-sd card up to 128 GB. Display – 5.2 Inch Display with HD+(1440*720 pixels resolution), 18:9 aspect ratio. Protection – Corning Gorilla Glass. OS – Android Oreo – Stock Experience. (Part of Android One Experience). Rear Camera – 13 Megapixel with f/2.0 aperture. Front Camera – 8 Megapixel with f/2.0 aperture and 84.6 degree view. Battery Capacity – 2990 mAH. Available From 21 July, 2018, on leading Stores. PROS – Great Build and Design, Android Oreo Stock Experience and Android One Phone. Cons – Seems very expensive for the Specs, should cost Rs. 8,000. Low 16 GB storage and just 2 GB Ram. No fingerprint scanner, and a poor processor. I would strongly suggest to stay away from this and explore more options in the 10k price range. Also, Nokia has recently launched the Nokia (X5) 5.1 in China which the company may also bring to the Indian market. Previous Phone Launches In India by Nokia. April 2018 – Nokia has launched 3 new phones in the Indian market back on 4th April 2018. Now all the three phones are on sale in India, recently the Nokia 6.1 (2018) has gone on sale on 14th May 2018 on Amazon India for a price of Rs. 18,999. The Nokia 8 Sirocco, Nokia 7 Plus and Nokia 6 (2018), these were highly anticipated in the country obsessed with Nokia. The Nokia 8 Sirocco is the most premium of the three and costs a fortune, Rs. 49,999 and is available on Flipkart. The Nokia 7 Plus is a mid-range device and competes with the likes of Oppo F7, Vivo V9, Moto X4 and costs Rs. 25,999 in the market and is available on Amazon India. Last but not the least, the new Nokia 6 (2018) costs Rs. 18,999 and competes with the newly launched Xiaomi Redmi Note 5 Pro. Notably, Nokia already has the Nokia 8 and Nokia 6 older versions available in the country but they never launched the Nokia 7 in India, despite there were rumors for its launch. For starters, the Nokia 6 comes with a more powerful processor in comparison to the Nokia 6 (2017). The Qualcomm Snapdragon 630 and the Adreno 508 GPU is a big upgrade over the Snapdragon 430 and the Adreno 505. The design is not a far cry from the existing Nokia 6 and comes with the same metallic build (6000 Series Aluminum body) that impressed us in the older phone. At the back, there is a single rear camera with Zeiss lens and a circular fingerprint scanner. The front side houses a 5.5 Inch Full HD Display with the 16:9 aspect ratio which seems old-fashioned in comparison to the voguish 18:9 aspect ratio display phones. The rear camera uses a single lens that has a f/2.0 aperture and 16 Megapixel resolution and comes with 1-micron pixel size. The front selfie camera comes with an 8-megapixel lens with 1.12-micron pixel and f/2.0 aperture size. Processor – Qualcomm Snapdragon 630 (Octa-Core) Max Clock Speed 2.2 GHz, Adreno 508 GPU. Storage – 64 GB internal storage, expandable via micro-sd card. Display – 5.5 Inch Display with Full HD (1920*1080 pixels resolution), 16:9 aspect ratio. Protection – Corning Gorilla Glass 3. Rear Camera – 16 Megapixel with f/2.0 aperture. Battery Capacity – 3000 mAH. Available From April 6, 2018, on leading Stores. Cons – Seems expensive for the Specs, lack of FHD+ display with 18:9 aspect ratio. Dual Cameras at the back would have been ideal. No mention of Fast Charging support. Rest All looks Good for the Nokia 6 (2018). The Nokia 7 plus competes with the Huawei Honor View 10 and the Nokia 8 in the sub 30k price range. There are other new options like the Vivo V9, Moto X4, Oppo F7 that you can compare the Nokia 7 Plus in the 20k to 30k price. The Nokia 7 Plus looks most exciting to me with adequate price and trendy features that we demand from the modern mid-range phones. For starters, it comes with Carl Zeiss Dual Rear camera setup and 18:9 aspect ratio FHD+ display. The sale for the Nokia 7 Plus will start from 30th April 2018 on Amazon and other key retailers like Chroma, Reliance Digital, Poorvika and Sangeetha Mobile. There are some useless launch offers which may not help reduce the price of 7 Plus in India. Like the Nokia 6, it also comes with the premium metallic design made from aluminum 6000-grade material from a single block. The design is drool-worthy, and the 6-inch FHD+, 18:9 aspect ratio display with minimal bezels, adds to the style quotient. What’s more, the rear camera comes with ultra-sensitive 12 Megapixel primary camera with 1.4-micron size and f/1.75 aperture. The second camera in the dual camera assembly has 13 Megapixel resolution and is a telephoto lens that can provide optical Zoom of 2X and has a f/2.6 aperture. Moreover, the rear camera is capable of clicking portrait shots and the bigger aperture also helps in capturing images in the low light conditions. Additionally, there is a 16 Megapixel front selfie camera that offers f/2.0 aperture and comes with nifty AI features to add masks to selfies. Lastly, it is a performance beast, as it runs on the latest Qualcomm Snapdragon 660 Processor that offers faster performance even compared to the Snapdragon 636 used by Xiaomi in the Redmi Note 5 Pro. Another highlight is the massive 3800 mAH capacity battery that makes sure it runs all day without the need for charging. The Nokia 7 Plus looks most impressive of the new Nokia phones launched in India. Processor – Qualcomm Snapdragon 660 (Octa-Core) Max Clock Speed 2.2 GHz, Adreno 512 GPU. Display – 6.0 Inch Display with Full HD+ (2160*1080 pixels resolution), 18:9 aspect ratio. Dual Rear Camera – 12MP+13MP with f/1.75 and f/2.6 aperture. Battery Capacity – 3800 mAH with fast charging support. Available From April 30, 2018, on leading Stores. Cons – Wish it would have been a little cheaper, but quality has a price. What Does “Sirocco” mean – A hot wind often dusty or rainy. That’s what Nokia plans to unleash on the rivals with the new most premium phone ever launched by the company. The Sirocco costs Rs. 49,999 in the Indian market and is significantly expensive in comparison to the OnePlus 5T or the Huawei View 10. But it has a superb build quality and Nokia says it is 2.5 times stronger in comparison to the aluminum 6000 material used in the Nokia 7 Plus. Moreover, it comes with a pOLED display, Wireless Charging and IP67 rating (dust and waterproof) features that are not present in the Oneplus 5T or other mid-range phones. Apart from the exquisite design, it comes with a Dual rear camera at the back with Carl Zeiss Optics. The Dual rear camera uses a 12 Megapixel primary lens with f/1.75 aperture and 1.4-micron pixel size. The secondary camera uses 13 Megapixel telephoto lens and can do a 2X optical Zoom. It has f/2.6 aperture size and comes with 1-micron pixel size. What’s strange, the camera on the more expensive Nokia 8 Sirocco looks same as the Nokia 7 Plus that costs almost half. Also, the front camera comes with a meager 5 Megapixel lens and has 1.4-micron pixel size. Seems like a downgrade in comparison to the 16 Megapixel camera on the Nokia 7 Plus. Unlike the Samsung S9 (US) that comes with the latest SD 845, the Nokia 8 Sirocco comes with the Snapdragon 835 processor. The SD 835 is now almost a year old and most next-gen flagships that will arrive in the coming months will offer the Snapdragon 845 processor that is significantly faster. The Nokia 8 Sirocco looks expensive and lacks 18:9 display and comes with same camera as 7 Plus. Processor – Qualcomm Snapdragon 835 (Octa-Core) Max Clock Speed 2.35 GHz, Adreno 540 GPU. Storage – 128 GB internal storage, non-expandable. Display – 5.5 Inch pOLED panel with QHD Display (2560*1440 pixels resolution), 16:9 aspect ratio. Protection – Corning Gorilla Glass 5. Front Camera – 5 Megapixel Selfie camera with 1.4-micron pixel size. Battery Capacity – 3260 mAH with fast charging support. Qi Wireless Charging Support. IP 67 Rating – Water and Dustproof. Cons – Exorbitant Price, lacks Snapdragon 845, Should have used better cameras than Mid Range Nokia 7 Plus, Fail to impress with the 2016ish 16:9 display. The Nokia 7 Plus is undoubtedly the silver lining in the new Nokia line-up, and I would recommend you to consider it if you are looking for a phone in the 20k to 30k price range. The Nokia 6 2018 and the Nokia 8 Sirocco misses on the essential features expected in the respective price range, and there are a lot of better alternatives that you can explore. The Nokia 7 Plus offers a pure Android experience which is parallel to an experience to what Google’s Pixel smartphones offer. The phone gives you a sense of confidence when it comes to performance as it just doesn’t fall short of what you can say a complete package. Many thanks for sharing this.